Nokia Asha QWERTY Promo Essay Writing Contest in the Philippines, Out! Win Nokia Asha 200 and Nokia Asha 303! TP Friends, you all know how much I love Nokia so I hope all of you can join this promo and treat it like a true TPGB! Totally reinforcing the insider info that I go a few hours ago regarding Nokia Asha 300's imminent release in our country, I just received an email from Nokia Philippines about their new 'Why do you QWERTY!' promo, which gives everyone a chance to take home either a - get this - Nokia Asha 200 or Nokia Asha 303 QWERTY handset! 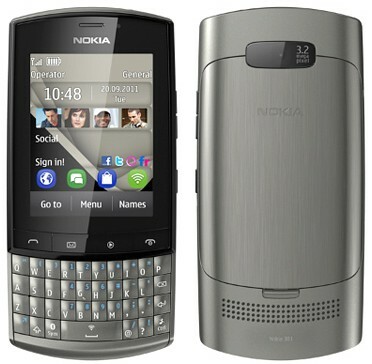 Nokia Asha 303 in Silver White. Cute, eh? The contest is open to all QWERTY phone users. All you have to do is write a 200-word essay on the topic: "How using a QWERTY phone changed my mobile life for the better." Your essay should describe your positive experiences and interesting anecdotes about using your QWERTY phone. In short, write it well and make it engaging! Your essay should be accompanied by a photo in JPEG format of yourself and your QWERTY phone. Send your entry via email to nokiaqwertypromo[at]ovi[dot]com. Four entries with the most interesting stories and the most creative photos will win a new Nokia QWERTY phone each: a Nokia Asha 200 for the 3rd prize; a Nokia Asha 303 for the 2nd prize; a pair of Nokia Asha 200 for the 1st prize; and a pair of Nokia Asha 303 for the grand prize. The Nokia Asha 303 is a touch screen device with a full physical QWERTY keypad. This stylish and slim device has lots of processing power that gives a rich web-browsing experience and quick-access to social networking applications. Likewise, it lets you stay connected to your loved ones and lets you have fun with great apps and its music player. The Nokia Asha 200 is ideal for young, urban consumers who find QWERTY phones aspirational and wish to connect to their social networks, but are also very price conscious. It is suited for their need to send messages quickly, for listening to music, and most importantly for having control over costs with the Easy Swap function. Deadline of submission of entries is on December 30, 2011. Join now, TP Friends!